He’ll take your coat. He’ll share his water bottle if you appear to be parched. He’ll pull you onstage if you’re wearing his favorite shirt (the one bearing his own first name in lightning-strike font). 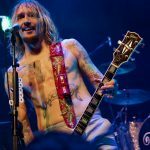 Is there anything Justin Hawkins or his bandmates in the Darkness won’t do for their fans? 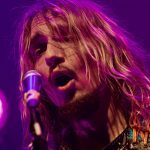 “We don’t do requests, unless it’s ‘Darkness, blow my f–king mind,’” Hawkins said in mock seriousness to a particularly zealous and vocal fan at Park West. 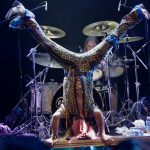 The British glam-rockers brought their high-octane hijinks to Chicago on Wednesday, featuring songs from their cheeky fifth album Pinewood Smile. 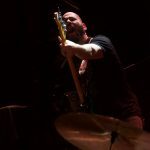 The band also treated fans to the bulk of their 2003 debut Permission to Land, and made stops at all points in between. The tone was set immediately. 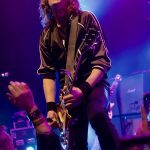 Dan Hawkins strode confidently to his Marshall stacks in his favorite Thin Lizzy jacket. 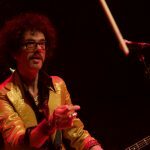 Decadently elegant bassist Frankie Poullain sported an unruly afro and a gold velvet suit. 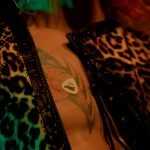 Wisecracking frontman Justin Hawkins appeared in a skin-tight, leopard-print body stocking with matching cape. 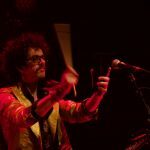 Throughout the evening, the band went the extra mile to connect, proving to be top-flight entertainers as well as hosts. 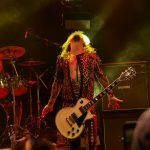 Justin Hawkins truly did offer to look after the coat of a red-faced gentleman in the front. “You look very warm, sir,” said Hawkins, adding that he’d be happy to go through the pockets as well, while handing the proffered parka to a stagehand. 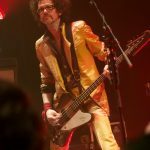 While soloing during “Love is Only a Feeling,” Hawkins pulled the slick maneuver of tossing his pick, kicking it off of his boot heel, catching it, and continuing with the song. Although an effortless showman, even Hawkins looked surprised and pleased that he’d pulled that one off. Other tomfoolery like the “plectrum mirror-ball challenge” kept the mood light in the company of thundering, heavy rockers like “Black Shuck” and its tall tale about a marauding demonic dog. Newer songs like “All the Pretty Girls” and “Solid Gold” showed the extremes of the band’s self-referential humor – self-deprecating on one hand, and self-aggrandizing on the other. None of the wit, strutting or flashy stunts would have worked so well if not for the jaw-dropping skill and talent possessed at every position within the band. 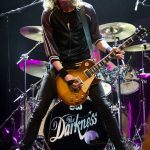 The Darkness have not only absorbed the music of bands like Queen, the Sweet, and AC/DC, but have created their own catalog that measures favorably against the past masters – albeit with measures of Spinal Tap and Looney Tunes in the mix. 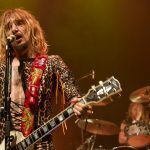 “Barbarian” and “Buccaneers of Hispaniola” were performed back-to-back in gleeful celebration of pillage and plunder, with the latter song raging like a hyper-caffeinated version of Led Zeppelin’s “Immigrant Song.” Justin Hawkins clearly relished both the music and pranksterism. 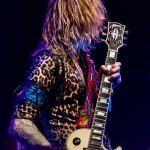 “I’m laughing a lot today, and afraid I might be undermining the seriousness of some of the songs,” he said before launching the Motörhead-styled riff-rocker “Southern Trains” and its profane indictment of the British railway system. 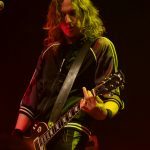 Brother Dan Hawkins proved his mettle with meticulous rhythm guitar and stylish solos during songs like the Faces-styled stomper “Givin’ Up.” Drummer Rufus Tiger Taylor gave a muscular performance at the drum kit, with unflagging energy and monstrous fills for songs like “Every Inch of You,” while the band displayed its knack for close vocal harmony. Poullain faced the cowbell intro of “One Way Ticket to Hell and Back” with steely-eyed focus and grim determination. 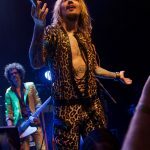 Justin Hawkins had the Park West audience as his choir during the sublime pop of “Friday Night.” Hawkins’ impossibly high falsetto on “Get Your Hands Off of My Woman” combined the finesse of the Bee Gees and menace of AC/DC’s Brian Johnson. The sharp-witted singer remained engaged with the crowd and proved adept at improvisation, accepting a cap from a fan that he stuck into his back pocket in order to look “like Springsteen, a man of the people straight from the factory.” Hawkins tried a woman’s leather jacket, but found it too tightly fitting to move his arms from scarecrow position, or remove without assistance. 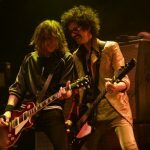 Another fan’s gold jacket proved to be a better fit, and was returned to its owner only after several songs – much sweatier. 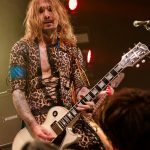 The Darkness encored with the intricate but heavy “Japanese Prisoner of Love,” followed by the Hawkins brothers’ euphoric twin-guitar leads for breakout single “I Believe in a Thing Called Love.” Following these obligatory call-backs, Justin Hawkins declared that the show and audience had been so exceptional that the crowd had earned a rarity – a bonafide extra performance. “Love on the Rocks with No Ice” stretched beyond 20 minutes, bringing the show to its conclusion with a final display of dazzling instrumental chops and good humor. Throughout, the concert was a great escape from drudgery, stress, conflict and fear pervasive in the outside world. Leave it to the Darkness to shine some much-needed light. Garage rockers Diarrhea Planet opened.